Would just stand and stare. As they tried to teach me how to dance. At the end of the movie, there was silence, absolute and total silence in the theater - and then, only an occasional sniffle until the end credits had finished rolling and the house lights came up. It would've seemed almost disrespectful to profane the silence with words. 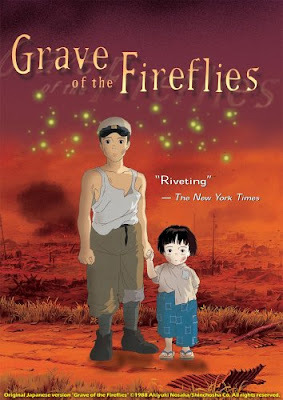 Seeing a movie like this really changes attitudes about war - about who really suffers, and that the honor and glory is shallow comfort when you contemplate what has been lost in the struggle. I've made the comment to my friends that if you ever see someone who isn't moved (usually to tears) by this movie, you've found someone without a soul. As difficult as it is to watch, turn off the phone, dim the lights, and immerse yourself in the film with ones you love - you will be a better person for it in the end. Even now, several years and several vewings later, its suffering and peacefullness remain a deeply touching experience. 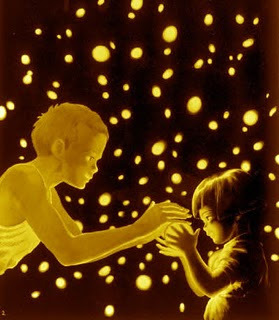 Fireflies is equally full of moments of serene beauty, scenes of peaceful vitality. 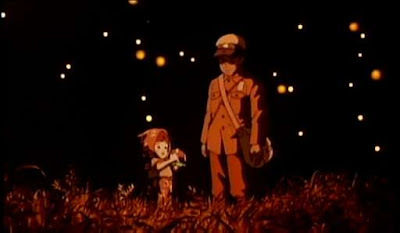 Visually, this is a beautiful movie. Everything is drawn in lush, vivid watercolors; the greens and blues of the lake, the saturated reds of a devastated Kobe, even the smoke from the bombers looks poetic. A bucket, a mop, a well - the film is littered with these snapshots of daily details. If you haven’t seen it you owe it to yourself to experience this profound study of war and its effects on the human condition. Este post foi publicado sexta-feira, novembro 27, 2009, por Unknown sob uma Licença Creative Commons.